Although that might sound crazy, but knowing math is one of the keys to creating great video slots. That’s probably the reason behind Lightning Box’s success. This developer was founded by mathematicians who have decades of experience in designing games. These smart professionals make sure you don’t just have nice visuals that make your play entertaining, but also get paid fairly. The developer has established partnership with countless other gaming companies. Therefore there’s a wide range of distribution channels and that makes it easy to find Lightning Box creations at online casinos. Some of their partners are widely recognized companies such as NYX Gaming, Betsson, Scientific Games, etc. There’s one thing about the portfolio presented by the developer – their games look and feel like land based slots. But, unlike many other land based casino games ported to the iGaming market, Lightning Box creations don’t look any worse than at brick and mortar gaming venues. 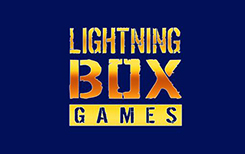 Best Lightning Box casinos offer fair games. The developer is regulated by a range of jurisdictions, including in USA. Despite being based in Australia, the supplier is trusted and well known way beyond the country’s borders. There are many big Lightning Box operators audited by multiple regulators. So, you can be sure their software is unbiased. In addition to online and offline gaming solutions, the company offers some of their best titles for social gaming. There are several games available on Facebook. Many more of their creations are playable on mobile devices. Most of their video slots don’t offer progressive jackpots, but there are some titles at reliable Lightning Box casinos which feature growing prize pools. Players would have a chance to hit one of three jackpots at a time: Mini, Minor and Major. These aren’t usually life changing jackpots, but you can have a nice amount of around couple of thousands if you get Major jackpot. Dolphin Gold, Chilli Goldx2, Jack Potter and More Monkey are all equipped with growing jackpots. However, keep in mind that usually progressive slots have other versions without jackpots. Gamble feature also isn’t present in every slot machine. But you’ll have a good selection of games with this feature. After activating risk game, you need to decide whether to guess card color or suit. The reward is 2 or 4 times your initial win respectively. More Monkeys, mentioned above has two versions. The difference is that one of them is progressive and the other is not. It’s a Chinese themed title with 1024 ways to win. Entering progressive jackpot bonus round is random. It can happen any time and when you enter the round, you’ll have to pick and click symbols to reveal a jackpot. Another attractive feature in this slot machine is the round of free games with increased number of stacked wilds and multipliers. Astro Cat has probably one of the most unconventional gameplays you will find at best Lightning Box casinos. If you look at the paytable, you can see there are five reels. However, third reel is basically a separate 4×4 reel set, and it was called Reelfecta. The difference is that Reelfecta symbols can’t help form multiple winning combinations. Each Reelfecta symbol can be used just once, while regular symbols can participate in as many as possible combinations. Astro Cat is a good, feature packed game offering free spins, wilds, locked wilds, Megaspin and 1296 ways to win. What you would love about Lightning Box creations is that players can get paid even for one symbol landing on reels. If you load Panda Pow after selecting any website on the list of Lightning Box casinos, you’ll be rewarded for every regular panda symbol. There are two more pandas, so don’t get confused. One is Red Bonus Panda, which is a wild and a scatter at the same time, and the other is Gold Panda which appears only during free spins.